Urgent shot requested by Romy Willing (Artisan acting CEO) required for publicity purposes. Downloadable .pdf – 1 – 2 here. 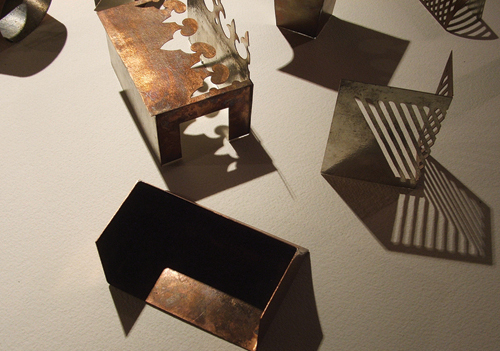 Two pieces remaining from the ‘process-documented’ show at Aaron Faber show in NYC 2007 that we then consigned to Makers Mark. They sold one piece and thankfully these two exhibition pieces have come back to the studio safe and sound. Ring Lace © Bh White Enamel Fusion, Antique Carved Jade, White Fresh water Pearls 18ct Yellow Gold. Sautoir Lace © Bh White Enamel Fusion, Antique Carved Jade, Graduated coloured Chrysophrase Sphere Beads, White Fresh Water Pearls, Infinity Symbol, Handmade Star Wire Chain 18ct Yellow Gold. 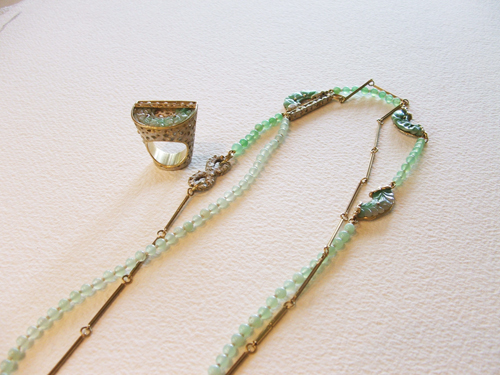 These two pieces remain for sale in the studio at the 2007 gold & make costs, (price on demand) if they last until the studio sale I’ll be surprised as they might also make an appearance at The MAYO Festival this year. Incidentally, 142 blog visitors have clicked on the main Mayo link in the last three days . . .
We live in Brisbane, Queensland and Tunbridge, Tasmania. Each week in the Weekend Australian, towards the back of the coloured liftout is ‘homehunt’ – highlighting houses for sale, Australia-wide. Sorry Phillip, but we first turn to this page to find out “where we are going to live this week” . . . mostly its Tasmania (somewhere). Well this week its a house we have visited many times in Ouse belonging to Paul Jones, my first clock mentor who moved to Tasmania proper in 2004 – so excited to see a house we love listed because we also know just how hard it is to get a property on these pages. This is a drawing of Listowel that I played with for a kitchen clock dial for the house, way back. Pure ingot alloyed and handmade © Barbara Heath Bracelet 2010 Commission for Fiona Hawthorn finished today. Our long colonial cedar showcase upstairs is going to Gallery Artisan, stuffed with various handmades from the urban_archaeology collection. 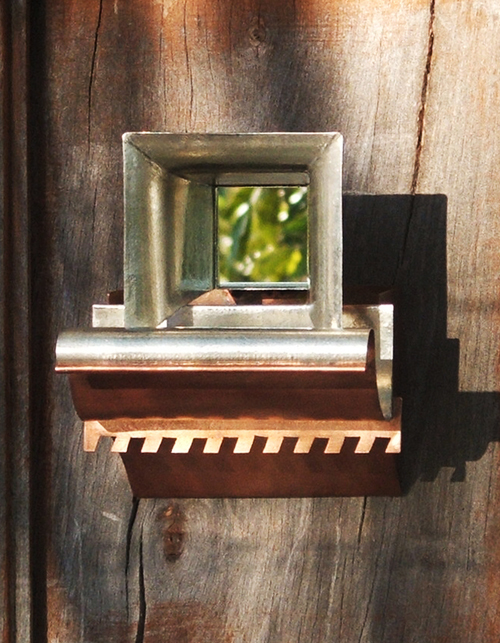 Augmented with colonial tinware kindly loaned from from the Heritage/Contemporary architects; Deslie and Richard Allom. 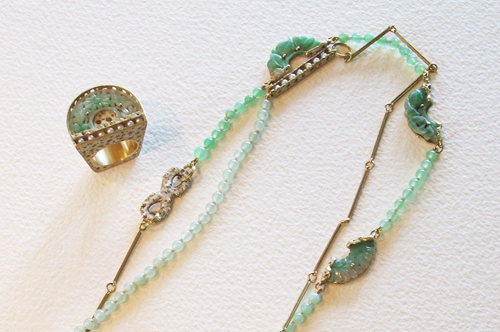 Juan-Luis Gonzalez’s pieces have been creeping into the studio as he uncovers more of them from his numerous hides. We made contact with other friends, the Heritage/Contemporary Architect; Robert Riddel who made his time and practice library available to Barbara and John Paas from Victorian Living who offered his take on the who, the when and the where. 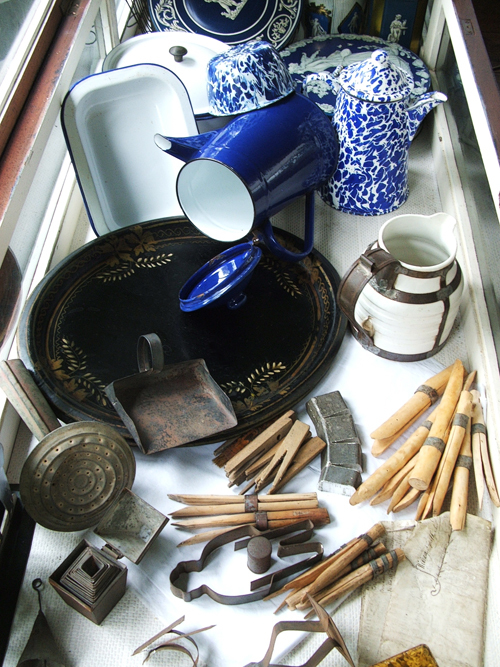 The exhibition will show the large tinware template residue of Graeme Gillespie’s life work, kindly loaned by his widow, Betty Gillespie. Previous blog posts have all disclosed specific details to hand and have mentioned our supporters. I’m now starting to collate all the texts and images posted in readiness for the studio produced catalogue, Barbara just has her research summary and bibliography to complete. We see Jane infrequently. No reason to come down to Brisbane really except to make a flight connection to the rest of the world. Living in western, central Queensland on a large pastoral property with all the mod cons means that we do all the business via communications channels and eye ball each other when a studio visit happens to try on the new goods. Here are the next two designs just completed and emailed to Sarina. The Smellie & Co building down the bottom of Edward street is now a listed landmark building. I walked past it each day on the way to my studio at Metro Arts further up Edward Street when I first arrived in Brisbane. The facade is fabulously endowed with locally made rich earthy bricks, this was both a manufacturing and retailing enterprise and a large business in 19th century Brisbane. I remember an early cedar and iron ‘corn husker’ with all the original Smellie graphics on the verandah at Lansdowne Street when I first met Mal. 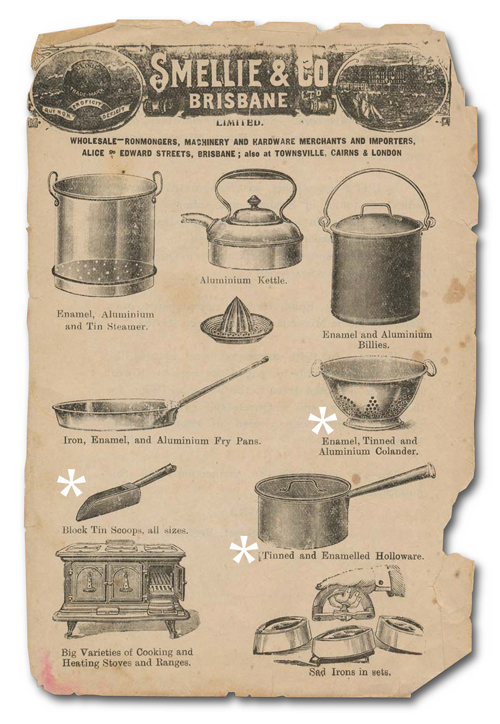 Three items marked with white asterisks (above) could well have been made in Brisbane c1880s. 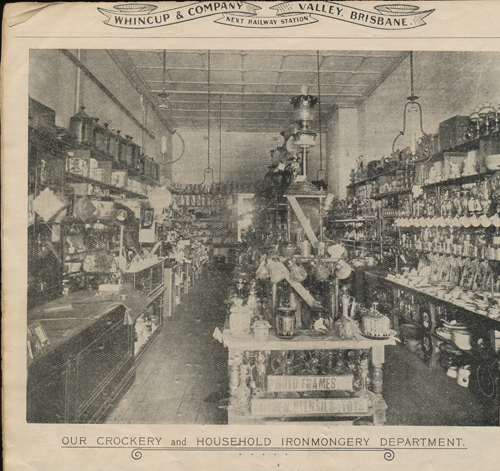 Another early colonial retailer was Whincup & Co in the Valley. This saddle stitched catalogue is a reminder of the forgotten retail clutter provided by those early suppliers. We believe this firm was situated where the old Walton’s Building still stands, Cnr Brunswick and Wickham Streets – here’s the full page .pdf (9.7Mb) with an additional three pieces of ‘collectable’ Seagrass Furniture. 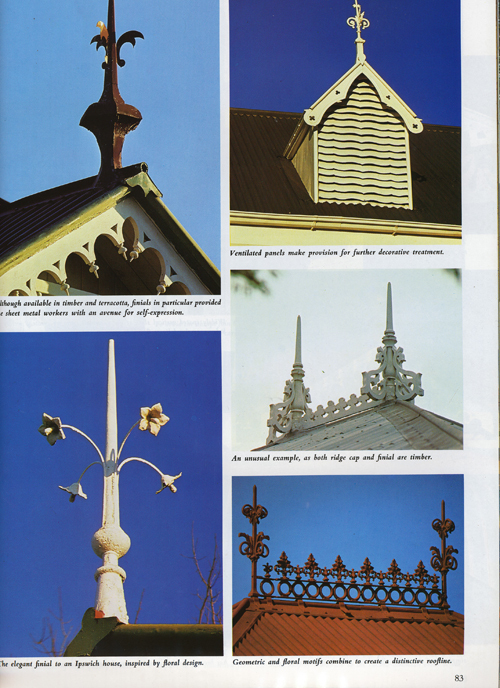 Wunderlich Patent Ceiling & Roof Company, Sydney produced press tin ceiling tiles and all the decorating options including wall linings, stair and dado panels, perforated centre-flowers which were quite the thing at the Turn of the Century. 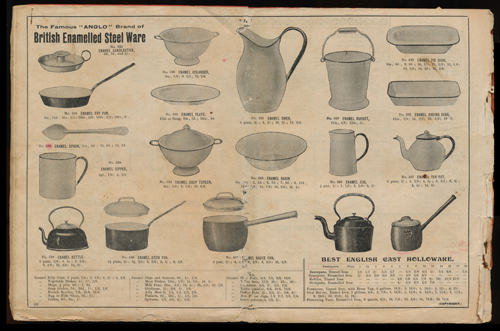 We have three different catalogues that certainly present a pictorial record of the industrial advancement of tinsmithing, once materials and machines were applied with design and marketing input. 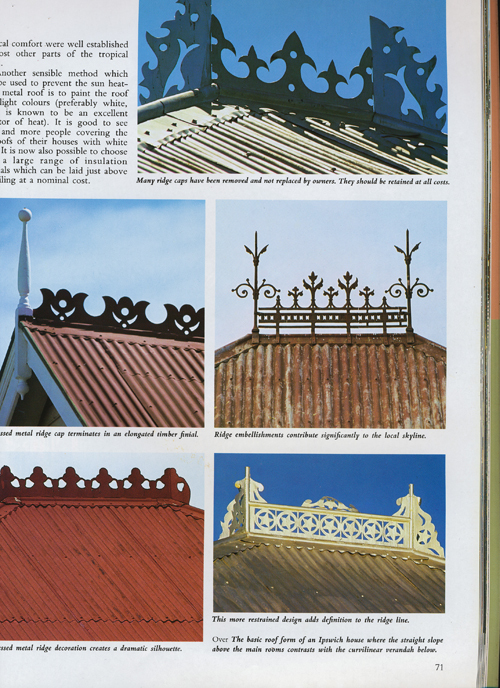 Here are three .pdfs of pages, (1) is of Fishscale Tiles, (2) and (3) show finials in place on rooftops in the Saini/Joyce book The Australian House, mentioned previously in our research. 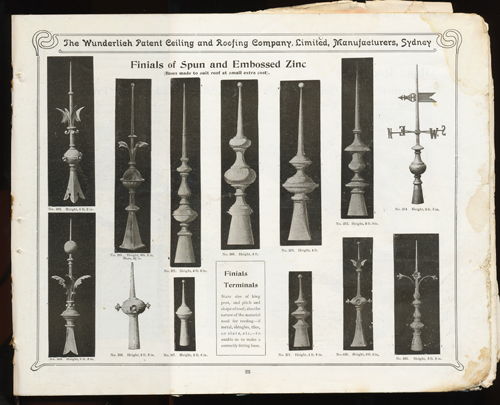 The Wunderlich Company commenced trading in 1887 and was a hugely successful firm which by 1900 employed over 1000 workers – their products clearly evidence the creative skills of metalsmiths at this time. 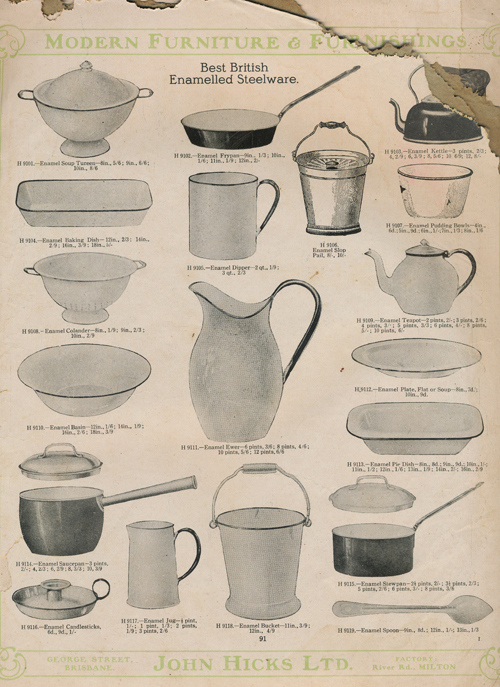 By c1901 most of the household tinware was imported by larger retailing firms. The decorative Japanned ware was superceded by white enamelled items which provided a clean, practical surface for domestic use. 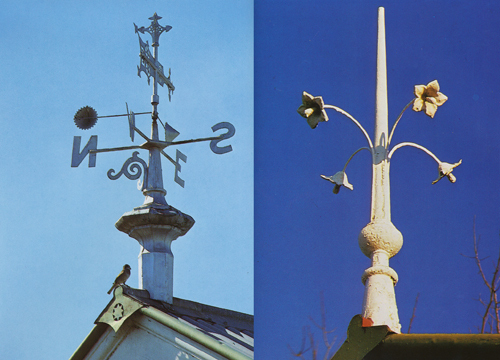 Unfortunately the roof crests and finials are often the first to be discarded when hasty repairs are made to the roof – erasing the scrolling shadows they traced across corrugated roofs and the delicate silhouettes they gave to the skyline. 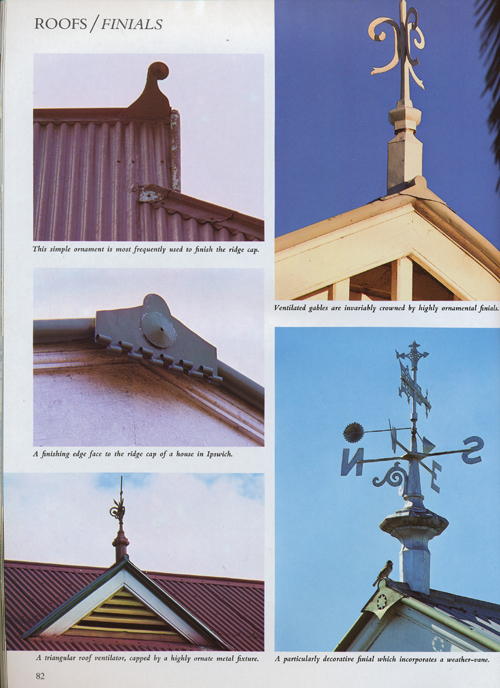 The Australian House – Homes of the Tropical North records these noteworthy examples, with photographs by Ray Joyce and text by Balwant Saini the book’s focus includes many fine details of cut tin ridge caps, window awnings as well as some inventive, highly decorative roof finials. 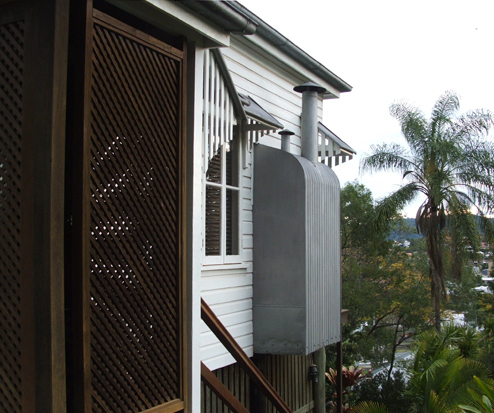 Roof ventilators permitted heated air to rise out of the roof cavity, producing a flow of air which cooled the building and these can still be seen atop old commercial buildings around Brisbane. 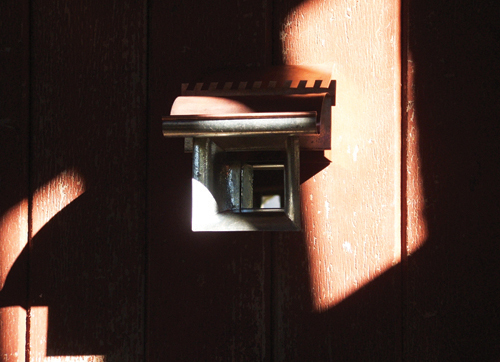 A practised eye can differentiate the local handmade type from later imports. R.C. 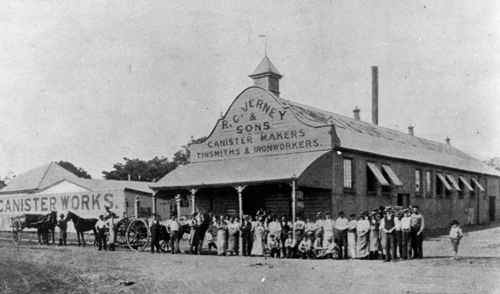 Verney & Sons factory in Fortitude Valley combined tinsmithing with jam making. 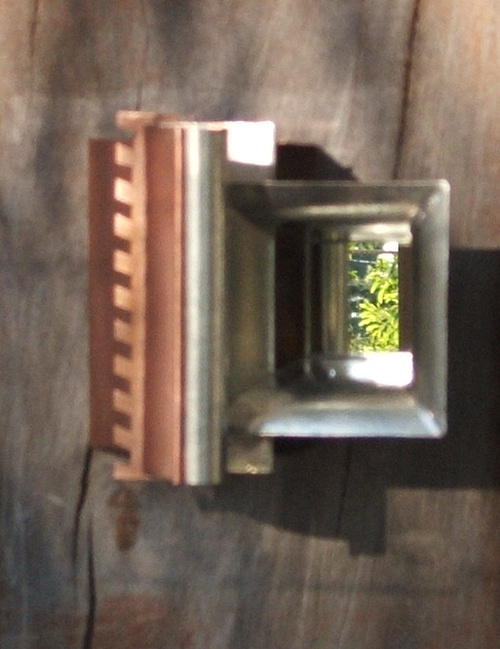 “Verney’s ventilators were the most popular in Queensland and many are still in service. 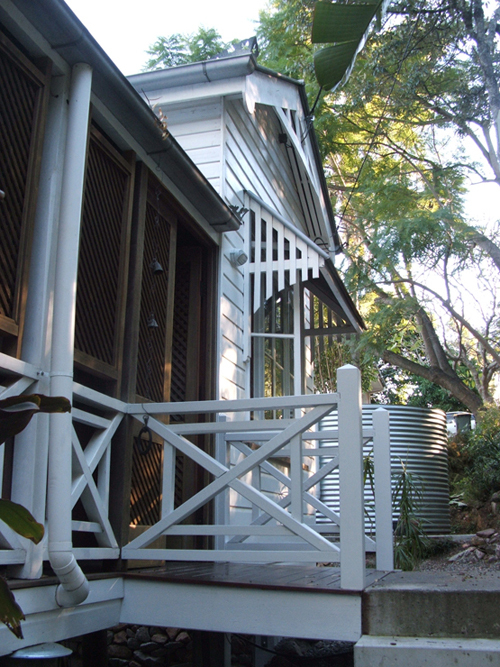 Verney’s business, which united the production of canisters and items of tin and steel with the manufacture of jam, appears odd today but such combinations were not unusual at that time.” Ian Evans – The Queensland House. 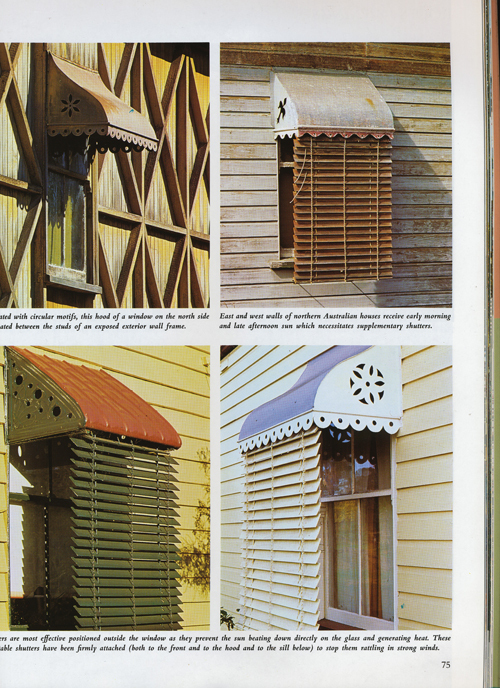 Perhaps one of the best known examples of the tinsmith’s repertoire is the window hood which provided shade to any window not protected by the verandah, these are often embellished with various patterns cut simply from the sheet metal by hand with a pair of tin snips. 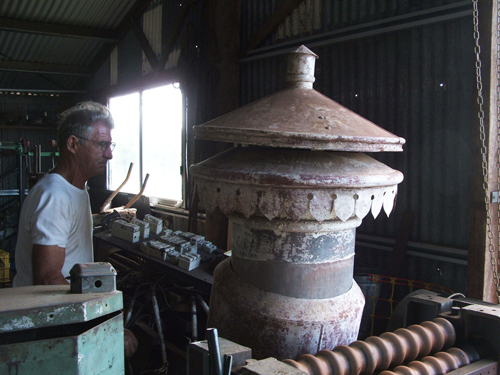 Graeme Gillespie was one of Brisbane’s last working tinsmiths, his shop Smith & Robertson at Woolloongabba was well known to heritage architects and builders. 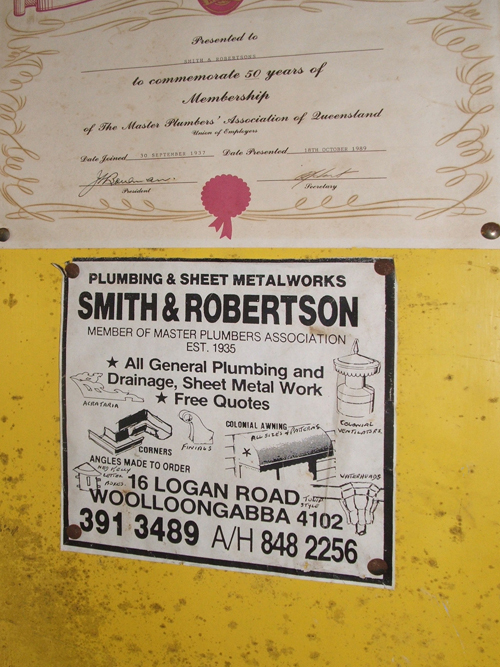 Apprenticed to the firm as a plumber in 1948 at 15 years of age, he spent his working life at the premises on Logan Road, which dated back to the 1850’s. 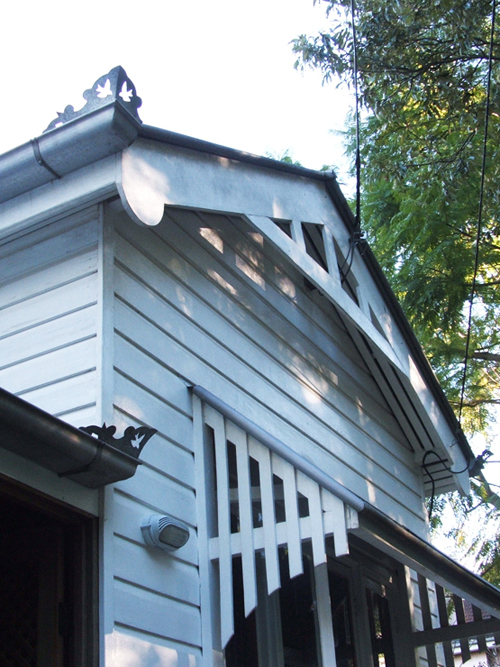 Throughout the 1980’s and 90’s there was an upsurge in the restoration of early Queensland houses and many home renovators were seeking to replicate heritage detailing. 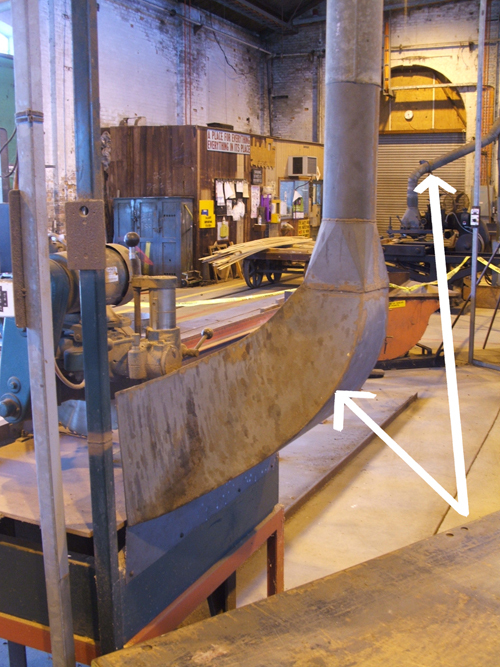 Importantly, many of the tools and machinery at Smith & Robertson were the same rollers, brakes, guillotines, edging and grooving machines made in 19th Century USA, that had mechanised the trade over a hundred years before and now facilitated the authentic replications this skilled maker produced. 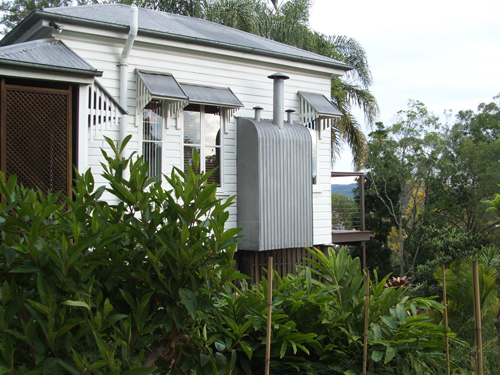 Our own house c1906 has examples of 19th Century design such as the placement of the kitchen stove in an alcove that extends outside the buildingproper – to lessen the risk of fire the alcove is sheeted in corrugated iron with a flue and chimney cap of tin. Most charming are the acroteria, decorative cut-outs rising from each corner of the guttering, when backlit by the ubiquitous Queensland blue sky the design reveals a ‘blue’ bird in flight’. Queensland Railway’s major workshops were located at Ipswich from the 1850s to the 1990s, the workshops employed a large workforce and were an important skill centre for over 140 years. Generations of skilled craftsmen built, repaired and overhauled locomotives, wagons and carriages. 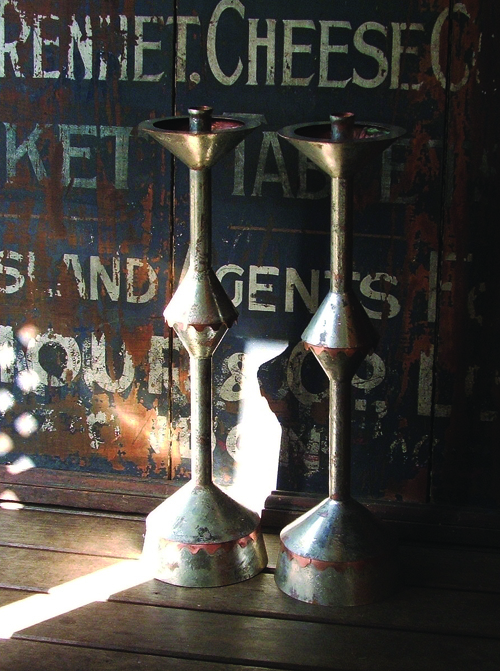 Blacksmiths, carpenters and metalsmiths – including tin and coppersmiths used their skills and knowledge to produce a wide variety of products. It was here that many tinsmiths would have learnt their skills, apprentices were trained across all the trades. 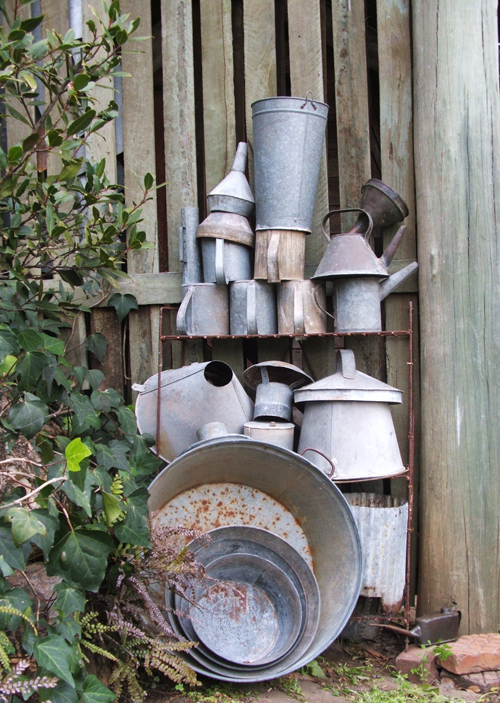 The tinsmiths custom made oil cans in a huge array of forms to meet the needs of the locomotive mechanics as well as fittings for the carriages. 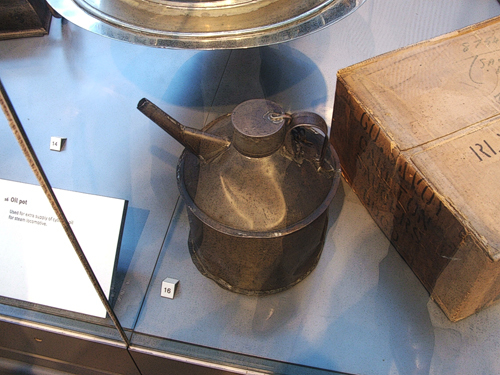 You can see remnant examples of their work throughout The Workshops, functional articles such as drip trays and exhaust vents, as well as some very early lamps and oil cans in the museum’s collection. We had been told that this was the last place in Queensland where tinsmiths were trained and Chayle Timbs, Visitor Experience Manager at The Workshops Museum tipped us off re: the annual Workers Reunion, which provided the perfect opportunity to speak with some current and ex QR staff. Several men recalled the tin and coppersmiths shop which was in a caged off area beside the carriage workshops. One man told of his father Peter Nunn who had worked as tinsmith there for 48 years and 7 weeks, beginning as an apprentice. Unfortunately however the tinsmiths cage had been pulled down the year before. 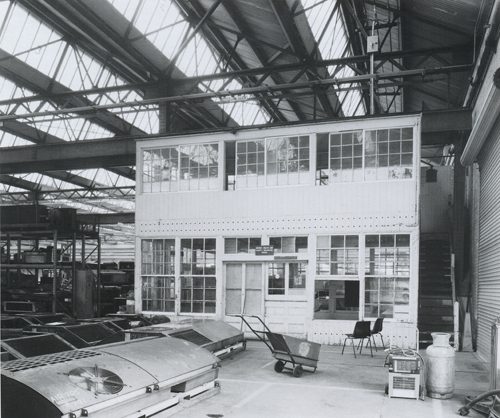 We have included Richard Stringer’s © image from his volume ‘Industrial Cycle’ Page 36, c1979. A further link to a mention on ephemeral-male here. Amongst the artworks commissioned for the site, two evocative quotes embedded into the pavement at the gateway to The Workshops encapsulated the human story – ‘sometimes several generations of a family worked here’ and ‘ at the end of each day 1,000 bicycles streamed out through the gate’. Our 36Mb powerpoint of the day is downloadable here. 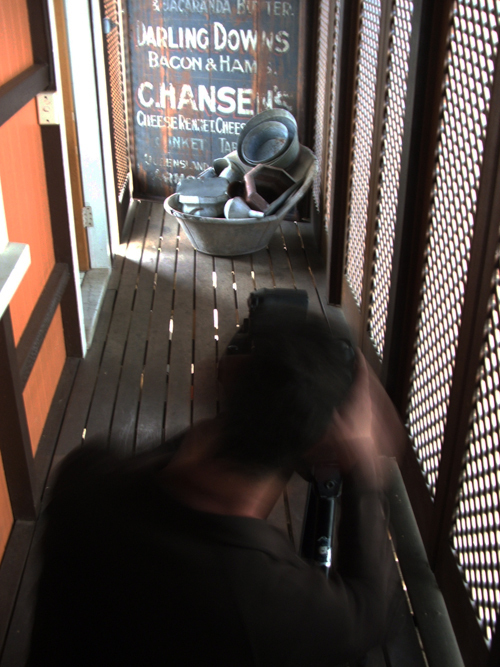 We are just on eight weeks from opening and the media flurry has started, “what have you got for us to shoot”? was the catch phrase last week. Sure there’s all these little sample experiences we’ve had . 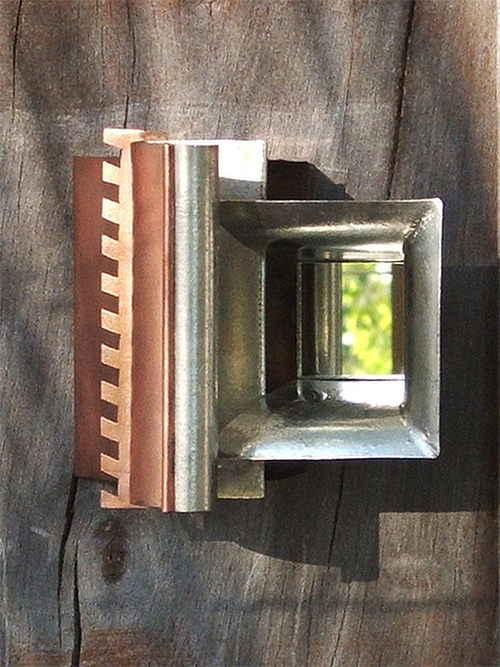 . . cutting, bending and tinning. “No, we want something that will be in the show” . . . so the studio quickly made a candle stick prototype and I posted that late last week . . . we had enormous fun putting all these disparate pieces together as various ‘house geisters’, those little spirit guards for the home that Barbara has made for so many previous commissioners. Below are some of the elements, next I’ll show just the one object in two different settings.